CINCINNATI, OH / ACCESSWIRE / April 22, 2019 / Callitas Health Inc., (CSE: LILY, OTCQB: MPHMF, FWB: T3F3), (the ”Company”or ”Callitas”) announced today that it has signed a letter of intent with Simply Wholeistic to manufacture and supply formulations of CannaStrip and other Simply Wholistic dietary supplement products for retail sale in the United States. Since 2015, Callitas has been developing technologies for both OTC and drug markets. Through controlled dosing, improved bioavailability and advanced manufacturing techniques, Callitas is able to offer customers a new level of innovation via its Cannabis platform. Established in 2019, Simply Wholeistic has created a new line of natural alternative and detox supplements that are designed to address the cause of health issues and help consumers practice preventive care and healthy living. About Simply Wholeistic: Innovative wellness company Simply Wholeistic, INC. was formed in January 2019 to develop and distribute a line of products, including a unique mood-balancing Hemp-Strip, that will provide natural alternatives to synthetic supplements. Formulated by Dr. Christina Rahm Cook each product has been designed, using the highest quality ingredients to get to the root of the underlying causes of health issues and problems. The first installment of natural non-GMO, vegan, gluten-free, organic, detox products will be available for purchase in the spring of 2019. About Callitas Health: Formed in early 2015, Callitas Health Inc. is an integrated clinical-stage pharmaceutical development, OTC consumer goods marketing and cannabis delivery development company, focused on developing innovative technologies for weight management, female sexual health and wellness, cannabis delivery technologies and other proprietary drugs. In addition to its recent acquisitions of C-103, a reformulation of Orlistat, Extrinsa and assets from 40J’s LLC, the Company successfully launched ToConceive in North America as a clinically proven option for couples struggling with the inability to conceive (www.toconceive.com), and is in the research and development and business development process for its other OTC products, CannaStrips and orphan drug technologies. For more information visit www.callitas.com. TORONTO, ON / ACCESSWIRE / April 22, 2019 / Pelangio Exploration Inc. (PX:TSX-V; OTC PINK:PGXPF) (“Pelangio” or the “Company”) is pleased to announce that a limited drilling program has commenced at the Dome West Property located 800 meters (“m”) west of the Dome Mine super pit in Timmins, Ontario (see Pelangio news release April 2, 2019 for further details). “We are excited to begin the diamond drill program on our Dome West gold property. The results of this program will be used in confirming the existence of a highly prospective porphyritic sill that is interpreted to extend across the Dome West property. This program represents our first step in advancing this strategic asset,” commented Ingrid Hibbard, President and CEO of Pelangio. The Dome West property, formerly controlled by Central Porcupine Mines Ltd., is a strategic land holding that is adjacent to both the former Paymaster Mine property and Goldcorp’s Dome Mine (Source: Ont. Dept of Mines Map 449B, Ferguson, 1969). The Dome West property is located approximately 800 m west of the Dome Mine and approximately 500 m northwest of the former Paymaster mine shaft. Pelangio acquires and explores large land packages in world-class gold belts in Canada and Ghana, West Africa. 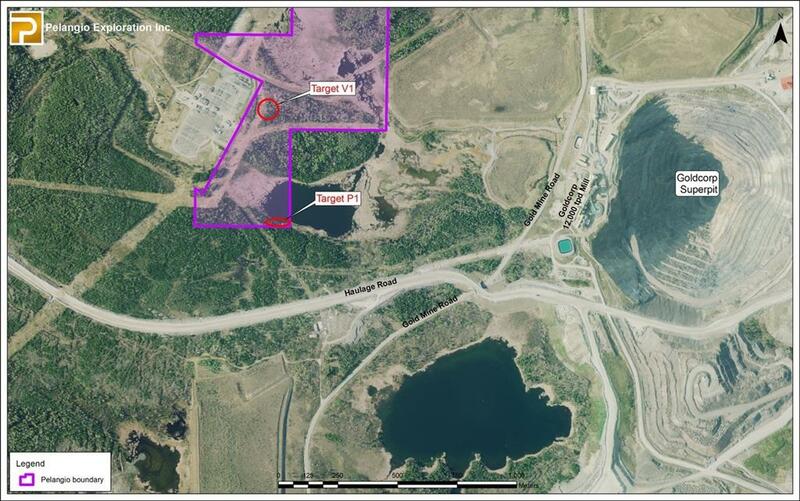 In Canada, the company is focusing on the Dome West property located 800 metres from the Dome Mine in Timmins, the 25 km2 Birch Lake Property located in the Red Lake Mining District, and the Dalton Property located 1.5 km from the Hollinger mine in Timmins. In Ghana, the Company is focusing on two 100%- owned camp-sized properties: the 100 km2 Manfo Property, the site of seven recent near-surface gold discoveries, and the 284 km2 Obuasi Property, located 4 km on strike and adjacent to AngloGold Ashanti’s prolific high-grade Obuasi Mine. Ghana is an English-speaking, common law jurisdiction that is consistently ranked amongst the most favourable mining jurisdictions in Africa. Certain statements herein may contain forward-looking statements and forward-looking information within the meaning of applicable securities laws. Forward-looking statements or information appear in a number of places and can be identified by the use of words such as “plans”, “expects” or “does not expect”, “is expected”, “budget”, “scheduled”, “estimates”, “forecasts”, “intends”, “anticipates” or “does not anticipate” or “believes” or variations of such words and phrases or statements that certain actions, events or results “may”, “could”, “would”, “might” or “will” be taken, occur or be achieved. Forward-looking statements and information include statements regarding the Company’s newly initiated exploration programs on the Dome West property, the Company’s strategy of acquiring large land packages in areas of sizable gold mineralization, the Company’s plans to follow-up on previous work, and the Company’s overall exploration plans. With respect to forward-looking statements and information contained herein, we have made numerous assumptions, including assumptions about the state of the equity markets. Such forward-looking statements and information are subject to risks, uncertainties and other factors which may cause the Company’s actual results, performance or achievements, or industry results, to be materially different from any future results, performance or achievements expressed or implied by such forward-looking statement or information. Such risks include the changes in equity markets, share price volatility, volatility of global and local economic climate, gold price volatility, increases in costs, exchange rate fluctuations, speculative nature of gold exploration including the risk that favourable results may not be obtained, and other risks involved in the gold exploration industry. See the Company’s annual and quarterly financial statements and management’s discussion and analysis for additional information on risks and uncertainties relating to the forward-looking statement and information. There can be no assurance that a forward-looking statement or information referenced herein will prove to be accurate, as actual results and future events could differ materially from those anticipated in such statements or information. Also, many of the factors are beyond the control of the Company. Accordingly, readers should not place undue reliance on forward- looking statements or information. We undertake no obligation to reissue or update any forward-looking statements or information except as required by law. All forward-looking statements and information herein are qualified by this cautionary statement. SAN FRANCISCO, CA / ACCESSWIRE / April 22, 2019 / According to The American Cancer Society (ACS) breast cancer is the most common cancer in American women, except for skin cancers. Currently, the average risk of a woman in the United States developing breast cancer sometime in her life is about 12%. This means there is a 1 in 8 chance she will develop breast cancer. This also means there is a 7 in 8 chance she will never have the disease. The American Cancer Society estimates there will be about 268,600 new cases of invasive breast cancer diagnosed in women in the United States for 2019. A new study performed by a team at Harvard Medical School has unexpectedly found that amino acid, leucine, may play a role in the formation of resistance to a certain drug, tamoxifen, that it used to treat estrogen receptor-positive (ER-positive) breast cancer. Founded in 2005, Vista Partners LLC (“Vista”) is a California Registered Investment Advisor based in San Francisco. Vista delivers timely and relevant insights via the website: www.vistapglobal.com with daily stories, weekly market updates, monthly macroeconomic newsletters, and Vista’s proprietary equity and market research to help you stay informed and stay competitive. Vista’s mission is to invest partner capital while arming investors with a comprehensive global financial perspective across all market sectors. Vista also seeks to provide select issuers with actionable advice regarding fundamental development, corporate governance, and capital market directives. Stay Informed! Stay Competitive! Receive FREE email updates. The potential opportunity that the stock represents. Mogo Finance Technology is a company that operates in the Canadian fintech space. Ultimately, the company’s product is a mix of what we see from Credit Karma (PRIVATE: KARMA), Square (SQ), Coinbase and LifeLock (acquired by Symantec SYMC). The company’s app, known simply as Mogo, gives users in Canada access to free credit scores, a spend card that allows them to track their purchases, and access to the cryptocurrency market without the convolution generally involved in the cryptocurrency space. Moreover, the company also offers hassle free lending, identity theft protection, budgeting tips, and more. Ultimately, MOGO designed its app to be a one-stop shop for all of the basics in personal finance, and it has done an incredible job in doing so. As investors, we often trust that the market has a way of assigning proper valuations. However, the truth of the matter is that there are several undervalued gems out there, and I believe that Mogo Finance Technology is one of them. In the chart above, you can see that the market is currently only valuing Mogo at a rate of about $75 per member. However, similar companies, Chime, a United States Challenger recently raised $200 million at a valuation of $1.5 billion. This places a value per member on the company in the amount of $500. N26, a challenger from Europe recently raised $300 million at a $2.7 billion valuation, leading to a value of $1,174 per member. Finally, Monzo, a UK competitor, recently raised funds at a $1.3 billion valuation, working out to a value per member of $1,623. Looking at this data, it’s easy to see that with more than 800,000 members at a value of only $75 per member, MOGO is highly undervalued. However, this is just the beginning. Interestingly, Canada is lagging the world when it comes to fintech. In fact, only 18% of Canadians have used two fintech products in the past 6 months. The global average is about double that. A big part of the reason for this is the lack of options in the Canadian fintech space. Ultimately, this means that Mogo Finance Technology has few competitors to contend with. Moreover, there is a growing population of millennials that are demanding digital financial solutions. With a banking sector that’s ripe for disruption and no other option on the market offering a consolidated digital financial management experience, MOGO is well positioned to take the market by storm. The opportunity here is hard to ignore. Sure, Canada’s market is about 10% the size of that in the United States for this type of product. However, when you look at the fact that the United States has more than 4,000 fintech companies and Canada has about 160, you can see that the potential for MOGO to take a lion’s share of the multi trillion-dollar market in Canada is real. The top 5 banks in Canada have had an oligopoly for the past 100 years and as a result they have the highest fees in the western world (a basic chequing account averages $15/month in Canada), creating a significant opportunity for Mogo’s freemium model and product offering. For those who think Canada’s market is too small, Canadian banks will make $100 billion in pre-tax profit this year (that’s profit, not revenue) and the market has already seen one successful new entrant sell for a multi-billion valuation – ING Direct started in Canada and grew to 1.8 million customers before it was sold to Scotiabank for CAD$3.1 billion. Ultimately, from a fundamental standpoint, the company is the ONLY one in its market that offers a comprehensive option to millennials that are demanding digital control over their finances. With growing use of fintech products in the region, an offering that’s unmatched, and little competition to contend with, MOGO is well-positioned to see rapid expansion throughout the Canadian market. The truth of the matter is that I’m not the only one that sees incredible value in Mogo. So far, six analysts from the United States and Canada have weighed in on the stock. All of these analysts have set price targets that represent potential growth in multiples ahead. However, the report that I found to be most important for MOGO came from Craig-Hallum Capital Group LLC. Before we get into what the firm said about the company, it’s important that you understand just who Craig-Hallum Capital is. Their fintech analyst is one of the most well-respected analysts on Wall Street today. Moreover, Craig-Hallum is known for strong calls in the fintech space. The analysts at the firm have issued compelling reports on Green Dot, Bottomline Technologies (EPAY), and PayPal (PYPL). Revenue Growth – First and foremost, the analysts involved in the report pointed to the company’s platform revenue growth rate, which currently sits at around 60%. This segment accounts for approximately half of the company’s revenue. The rest of the revenue comes from the Mogo Loan department and interest revenue. Freemium – At the moment, banks in Canada charge between $4 and $30 per month for basic checking account services. Craig-Hallum believes that the freemium model that gives consumers access to many of these services without cost will lead to a disruption in the Canadian banking space. Potential Growth – Finally, Craig-Hallum sees MOGO revenue having the potential to grow to CA$900 million (US$672.75 million) by the year 2021, which could result in the stock trading at more than $18 per share by the end of the same year. The bottom line here is simple. Canadian fintech companies have offered consumers little by way of money management platforms, while millennials in the region are hungry for solutions. Not only does MOGO offer a great solution, but the company’s platform is second to none with regard to features offered to consumers. At the same time, the company is highly undervalued when compared to its peers in the space. With other companies in the space having valuations that are far higher while displaying similar metrics with regard to users, similar or even less revenue, and meager revenue growth, MOGO seems to be a top-pick in the Canadian fintech space, and I believe it has incredible potential to generate strong profits for investors! This article was originally published with all relevant disclosures on CNA Finance. SAN FRANCISCO, CA / ACCESSWIRE / April 22, 2019 / The community and employee engagement startup Beliive announced the launch of its platform in the United States. The company uses a time-based currency model to facilitate flow of talent and skills within companies where employees tend to operate in their respective silos and limit collaboration. This marketplace created by Beliive also gained popularity outside of the workplace where people offered their skills and knowledge to others in need, across a global network. Using Beliive you can offer one hour of guitar lesson and in exchange, receive a one hour time credit which you can exchange for any activity available in the global community, like financial advice, makeup tips or public speaking lessons. Beliive is positioned to become a staple within larger organizations that suffer from lack of collaboration among members of various business units. After closing several contracts with multinational companies like Unilever, Beliive secured a strategic investment from a prominent venture capital firm in the Valley to expand operations in the United States. Former Global Agenda Council in Creative Economy by the World Economy Forum and MIT’s TR35, Beliive’s CEO Lorrana Scarpioni, observed that the companies save a multiple of what they pay for in Beliive platform fee by avoiding hiring of outsourced contractors, but she believes that the real return is realized when companies save millions of dollars by prolonged employee retention, increased collaboration and an overall strengthening of bonds among employees. Continuous use of the Beliive platform is enabling us to discover specific needs and interests of the workforce, which differs from organization to organization. ”This data could be used and deployed by senior management to tailor innovative strategies for employee”, says Piyush Bhardwaj, a social impact investor and advocate for spreading financial inclusion utilizing technological platforms. Beliive’s revenue will come from partnerships with companies, universities, city-governments and brands that pay for access to the time exchange platforms known as “Beliive Communities.” As an innovative company that uses time as a currency of exchange, Beliive has expanded the time banking model to a global online economy and has been successful in Brazil and in other countries, acquiring a large number of new users willing to share their time and their experiences with other people. With more than 900,000 hours available, Beliive’s time credits are becoming an alternative for people that may not have extra money, but still have talents to share. Using Beliive, for the very first-time talent and skill-sets could be exchanged easily on a global scale and where centralized organizations like Fiverr don’t need to function as middlemen. The inspiration for Beliive is driven by unlocking human abundance by offering an alternative to centralized authorities whether that this is banks or other ”brokers”. The very core of the idea is to let people exchange their passions and receive what you need in-return to carry out your life. It’s akin to the barter system ages ago, but on a reciprocal and global scale – thanks to the internet. Speaking at an event during the World Economic Forum in Davos Switzerland, alongside Al Gore and Marc Benioff, CEO of Salesforce, Lorrana shared her vision about the future “I see communities playing a very strong role in any relationships that we have as human beings. Communities based on shared values to influence democracy, society and companies, too.” she says. SUWANEE, GA / ACCESSWIRE / April 22, 2019 / SANUWAVE Health, Inc. (OTCQB: SNWV) (www.sanuwave.com) SANUWAVE Health, Inc. is an emerging regenerative medicine company focused on the development and commercialization of noninvasive, biological response activating devices for the repair and regeneration of tissue, musculoskeletal and vascular structures. SANUWAVE Health, Inc. will present at the Planet MicroCap Showcase at on Wednesday, May 1, 2019 and will conduct 1on1 meetings on May 2, 2019. If you have any questions about the Planet MicroCap Showcase, please contact Robert Kraft at rkraft@snnwire.com (424) 227-9018, or visit www.planetmicrocapshowcase.com for more information. SANUWAVE Health, Inc. (OTCQB: SNWV) (www.sanuwave.com) is a shock wave technology company initially focused on the development and commercialization of patented noninvasive, biological response activating devices for the repair and regeneration of skin, musculoskeletal tissue and vascular structures. SANUWAVE’s portfolio of regenerative medicine products and product candidates activate biologic signaling and angiogenic responses, producing new vascularization and microcirculatory improvement, which helps restore the body’s normal healing processes and regeneration. SANUWAVE applies its patented PACE® technology in wound healing, orthopedic/spine, plastic/cosmetic and cardiac conditions. Its lead product candidate for the global wound care market, dermaPACE®, is US FDA cleared for the treatment of Diabetic Foot Ulcers. The device is also CE Marked throughout Europe and has device license approval for the treatment of the skin and subcutaneous soft tissue in Canada, South Korea, Australia and New Zealand. SANUWAVE researches, designs, manufactures, markets and services its products worldwide, and believes it has demonstrated that its technology is safe and effective in stimulating healing in chronic conditions of the foot (plantar fasciitis) and the elbow (lateral epicondylitis) through its U.S. Class III PMA approved OssaTron® device, as well as stimulating bone and chronic tendonitis regeneration in the musculoskeletal environment through the utilization of its OssaTron, Evotron® and orthoPACE® devices in Europe, Asia and Asia/Pacific. In addition, there are license/partnership opportunities for SANUWAVE’s shock wave technology for non-medical uses, including energy, water, food and industrial markets. SANUWAVE Health, Inc. is an emerging regenerative medicine company focused on the development and commercialization of noninvasive, biological response activating devices for the repair and regeneration of tissue, musculoskeletal and vascular structures. By Peoples Bancorp of North Carolina, Inc.
Net earnings were $3.7 million or $0.61 basic and diluted net earnings per share for the three months ended March 31, 2019, compared to $3.3 million or $0.55 basic and diluted net earnings per share for the same period one year ago. Total loans increased $57.8 million to $823.6 million at March 31, 2019, compared to $765.8 million at March 31, 2018. Core deposits were $887.6 million or 97.74% of total deposits at March 31, 2019, compared to $889.0 million or 97.94% of total deposits at March 31, 2018. Lance A. Sellers, President and Chief Executive Officer, attributed the increase in first quarter net earnings to an increase in net interest income and an increase in non-interest income, which were partially offset by an increase in the provision for loan losses and an increase in non-interest expense during the three months ended March 31, 2019, as compared to the three months ended March 31, 2018, as discussed below. Net interest income was $11.4 million for the three months ended March 31, 2019, compared to $10.3 million for the three months ended March 31, 2018. The increase in net interest income was primarily due to a $1.4 million increase in interest income, which was partially offset by a $290,000 increase in interest expense. The increase in interest income was primarily attributable to an increase in the average outstanding balance of loans and a 0.75% increase in the prime rate since March 31, 2018. Net interest income after the provision for loan losses was $11.2 million for the three months ended March 31, 2019, compared to $10.3 million for the three months ended March 31, 2018. The provision for loan losses for the three months ended March 31, 2019 was $178,000, compared to $31,000 for the three months ended March 31, 2018. The increase in the provision for loan losses is primarily attributable to a $57.8 million increase in loans from March 31, 2018 to March 31, 2019. Non-interest income was $4.1 million for the three months ended March 31, 2019, compared to $3.7 million for the three months ended March 31, 2018. The increase in non-interest income is primarily attributable to a $231,000 increase in gains on the sale of securities during the three months ended March 31, 2019, compared to the same period one year ago. Non-interest expense was $10.9 million for the three months ended March 31, 2019, compared to $10.0 million for the three months ended March 31, 2018. The increase in non-interest expense was primarily attributable to a $685,000 increase in salaries and benefits expense, which was primarily due to an increase in the number of full-time equivalent employees and annual salary increases. Income tax expense was $785,000 for the three months ended March 31, 2019, compared to $652,000 for the three months ended March 31, 2018. The effective tax rate was 17.63% for the three months ended March 31, 2019, compared to 16.49% for the three months ended March 31, 2018. Total assets were $1.1 billion as of March 31, 2019 and 2018. Available for sale securities were $184.4 million as of March 31, 2019, compared to $213.3 million as of March 31, 2018. Total loans were $823.6 million as of March 31, 2019, compared to $765.8 million as of March 31, 2018. Non-performing assets were $2.8 million or 0.25% of total assets at March 31, 2019, compared to $3.7 million or 0.34% of total assets at March 31, 2018. Non-performing loans include $2.7 million in commercial and residential mortgage loans and $89,000 in other loans at March 31, 2019, as compared to $3.4 million in commercial and residential mortgage loans, $130,000 in acquisition, development and construction loans and $114,000 in other loans at March 31, 2018. The allowance for loan losses at March 31, 2019 was $6.6 million or 0.80% of total loans, compared to $6.4 million or 0.83% of total loans at March 31, 2018. Management believes the current level of the allowance for loan losses is adequate; however, there is no assurance that additional adjustments to the allowance will not be required because of changes in economic conditions, regulatory requirements or other factors. Deposits were $908.1 million at March 31, 2019, compared to $907.6 million at March 31, 2018. Core deposits, which include noninterest-bearing demand deposits, NOW, MMDA, savings and non-brokered certificates of deposit of denominations less than $250,000, were $887.6 million at March 31, 2019, compared to $889.0 million at March 31, 2018. Certificates of deposit in amounts of $250,000 or more totaled $20.4 million at March 31, 2019, compared to $17.9 million at March 31, 2018. Securities sold under agreements to repurchase were $41.2 million at March 31, 2019, compared to $38.3 million at March 31, 2018. Shareholders’ equity was $126.6 million, or 11.39% of total assets, at March 31, 2019, compared to $116.5 million, or 10.65% of total assets, at March 31, 2018. The Company repurchased 5,518 shares of its common stock during the first quarter of 2019 under the Company’s stock repurchase program, which was funded in February 2019. Statements made in this press release, other than those concerning historical information, should be considered forward-looking statements pursuant to the safe harbor provisions of the Securities Exchange Act of 1934 and the Private Securities Litigation Act of 1995. These forward-looking statements involve risks and uncertainties and are based on the beliefs and assumptions of management and on the information available to management at the time that this release was prepared. These statements can be identified by the use of words like “expect,” “anticipate,” “estimate,” and “believe,” variations of these words and other similar expressions. Readers should not place undue reliance on forward-looking statements as a number of important factors could cause actual results to differ materially from those in the forward-looking statements. Factors that could cause actual results to differ include, but are not limited to, (1) competition in the markets served by Peoples Bank, (2) changes in the interest rate environment, (3) general national, regional or local economic conditions may be less favorable than expected, resulting in, among other things, a deterioration in credit quality and the possible impairment of collectibility of loans, (4) legislative or regulatory changes, including changes in accounting standards, (5) significant changes in the federal and state legal and regulatory environment and tax laws, (6) the impact of changes in monetary and fiscal policies, laws, rules and regulations and (7) other risks and factors identified in the Company’s other filings with the Securities and Exchange Commission, including but not limited to those described in the Company’s annual report on Form 10-K for the year ended December 31, 2018. At March 31, 2019, including non-accrual loans, there were two relationships exceeding $1.0 million in the Watch risk grade (which totaled $3.2 million). There were no relationships exceeding $1.0 million in the Substandard risk grade. SOURCE: Peoples Bancorp of North Carolina, Inc.
SAN MATEO, CA / ACCESSWIRE / April 22, 2019 / Allysta Pharmaceuticals, Inc. (Allysta) today announced that Kathryn Crawford, Ph.D., the company’s Vice President and Head of Non-Clinical Development, will present at the Annual Meeting of ARVO, in Vancouver, British Columbia. Dr. Crawford will present new data on the effects of ALY688, an adiponectin analogue, in a rabbit model of dry eye disease. The Association for Research in Vision and Ophthalmology (ARVO) is the largest and most respected eye and vision research organization in the world. ARVO advances research worldwide into understanding the visual system and preventing, treating and curing its disorders. The Annual Meeting is the largest gathering of eye and vision researchers in the world, attracting over 11,000 attendees from more than 75 countries. Allysta is a privately-held biopharmaceutical company developing first-in-class peptide therapeutics with a focus in dry eye and liver diseases. The company’s lead compound, ALY688, acts as an agonist of the adiponectin receptor and induces adiponectin-like responses. Since its discovery more than 20 years ago as a major hormone produced by adipocytes and other cell types, many studies have shown that adiponectin has beneficial actions on multiple organs and cell types because of its anti-inflammatory, insulin-sensitizing, anti-atherogenic, anti-steatotic, and anti-fibrotic properties. This broad range of activity provides an opportunity to evaluate ALY688 in multiple disease indications. Data from disease models have been consistent with predicted biologic effects. For example, in ocular models of dry eye and corneal injury, ALY688 decreased inflammation on the ocular surface (both T cell and pro-inflammatory cytokines) and promoted rapid healing (re-epithelization) following corneal injury. Additionally, in models of liver fibrosis, ALY688 reduced inflammation, hepatocyte injury, and fibrosis. CHARLOTTESVILLE, VA / ACCESSWIRE / April 22, 2019 / Adial Pharmaceuticals, Inc. (NASDAQ: ADIL; ADILW), a clinical-stage biopharmaceutical company focused on the development of medicines for addiction, today announced that its Chief Medical Officer, Bankole Johnson, MD, a recent recipient of the American Society of Addiction Medicine’s highest honor, was featured on WPTV-TV, the NBC affiliate in West Palm Beach, Florida. Dr. Johnson discussed the fight against alcohol use disorder (AUD), opioid addiction and the addiction epidemic. As Chief Medical Officer of Adial Pharmaceuticals, Dr. Johnson is supporting the advancement of Adial’s anticipated Phase 3 trial of its lead investigational drug, AD04, as a potential treatment for AUD in patients with certain, targeted genetics. AD04 is also believed to have the potential to treat other addictive disorders such as opioid use disorder, gambling, and obesity. Adial Pharmaceuticals is a clinical-stage biopharmaceutical company focused on the development of treatments for addictions. The Company’s lead investigational new drug product, AD04, is a genetically targeted therapeutic agent for the treatment of alcohol use disorder (“AUD”). A Phase 2b clinical trial of AD04 for the treatment of AUD showed promising results in reducing frequency of drinking, quantity of drinking and heavy drinking (all with statistical significance), and no overt safety concerns (there were no statistically significant serious adverse events reported). The Company plans to shortly commence a Phase 3 clinical trial using AD04 for the potential treatment of AUD in subjects with certain target genotypes, which are to be identified using the Company’s proprietary companion diagnostic genetic test. AD04 is also believed to have the potential to treat other addictive disorders such as opioid use disorder, gambling, and obesity. This communication contains certain ‘forward-looking statements’ within the meaning of the U.S. federal securities laws. Such statements are based upon various facts and derived utilizing numerous important assumptions and are subject to known and unknown risks, uncertainties and other factors that may cause actual results, performance or achievements to be materially different from any future results, performance or achievements expressed or implied by such forward-looking statements. Statements preceded by, followed by or that otherwise include the words ‘believes,’ ‘expects,’ ‘anticipates,’ ‘intends,’ ‘projects,’ ‘estimates,’ ‘plans’ and similar expressions or future or conditional verbs such as ‘will,’ ‘should,’ ‘would,’ ‘may’ and ‘could’ are generally forward-looking in nature and not historical facts, although not all forward-looking statements include the foregoing. These statements are based upon current beliefs, expectations and assumptions and include statements regarding AD04 as a potential treatment for alcohol use disorder (AUD) in patients with certain, targeted genetics, the belief that AD04 has the potential to treat other addictive disorders such as opioid use disorder, gambling, and obesity and the plans to commence a Phase 3 clinical trial using AD04 for the potential treatment of AUD in subjects with certain target genotypes, which are to be identified using our proprietary companion diagnostic genetic test. Any forward-looking statements included herein reflect our current views, and they involve certain risks and uncertainties, including, among others, our ability commence the Phase 3 clinical trials as planned, the ability of AD04 to perform as designed, to demonstrate safety and efficacy, as well as results that are consistent with prior results, the ability of AD04 to treat other addictive disorders such as opioid use disorder, gambling, and obesity, the ability to enroll patients and complete the clinical trials on time and achieve desired results and benefits, our ability to obtain regulatory approvals for commercialization of product candidates or to comply with ongoing regulatory requirements, regulatory limitations relating to our ability to promote or commercialize our product candidates for specific indications, acceptance of its product candidates in the marketplace and the successful development, marketing or sale of products, our ability to maintain our license agreements, the continued maintenance and growth of our patent estate, our ability to establish and maintain collaborations, our ability to obtain or maintain the capital or grants necessary to fund its research and development activities, and our ability to retain our key employees or maintain our Nasdaq listing. These risks should not be construed as exhaustive and should be read together with the other cautionary statements included in Annual Report on Form 10-K for the year ended December 31, 2018, and our subsequent filings with the Securities and Exchange Commission. Any forward-looking statement speaks only as of the date on which it was initially made. We undertake no obligation to publicly update or revise any forward-looking statement, whether as a result of new information, future events, changed circumstances or otherwise, unless required by law. Vancouver, British Columbia–(Newsfile Corp. – April 22, 2019) – Nextleaf Solutions Ltd. (CSE: OILS) (“OILS” or the “Company“) is pleased to announce, due to initial demand for the non-brokered private placement announced on April 15, 2019 (the “Financing“), it will be increasing the non-brokered private placement financing amount up to $4,000,000. Management and insiders of the Company plan to subscribe for between $500,000 and $1,000,000 of the Financing. The units to be issued under the Financing will be subject to a four month hold period. Additional details regarding the Financing can be found in the Form 9 filed in accordance with the rules of the Canadian Securities Exchange, a copy of which is accessible at www.thecse.com under the Company’s profile. Nextleaf Solutions Ltd. (CSE: OILS) is an extraction technology company that has developed a portfolio of issued and pending patents pertaining to the company’s unique, industrial-scale process of producing purified cannabinoid distillate, a tasteless, odourless cannabis concentrate best suited for infusing premium value-added products. OILS plans to commercialize its intellectual property portfolio by providing B2B processing services to licensed cultivators and supplying cannabis oil and extracts to qualified Canadian and international partners under the client’s own brands. OILS has completed construction of its dedicated extraction and processing facility in Greater Vancouver, British Columbia, in time for Canada’s legalization of edibles and other cannabis derivative products. For more information about OILS visit www.nextleafsolutions.com or follow the Company across social media platforms. Posted: April 22nd, 2019 under NEWSFILECORP.